Description Of Item: NOTE: All Webkinz bought cannot be returned. It is sold as is and not returnable due to a unique code attached to each Webkinz. Please take note of this before Purchasing the item. 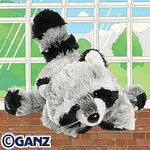 Webkinz toys are a collection of very special plush pets. Every Webkinz pet wears a tag with a secret code that can only be read after purchase. This code is the password into Webkinz World, an online world for the young at heart. After they log in, kids can name and adopt their new pet, learn all about it, play and have fun. Furnish a room, chat with other members, play trivia challenges and visit the arcade. Shop for clothes, food, toys and furniture at the W Shop.